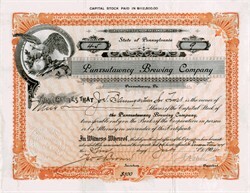 Beautiful stock certificate from the Punxsutawney Brewing Company issued in 1904. This historic document was printed by the American Banknote Company and has an ornate border around it with a vignette of an eagle. This item has the hand signatures of the Company’s President and Secretary. Punxsutawney's most famous resident is Punxsutawney Phil, a groundhog said to predict the weather annually on Groundhog Day (February 2). Phil and the town were the basis for the 1993 film Groundhog Day. The film actually made the name "Punxsutawney Phil" a national cultural reference in the US. Punxsutawney Brewing Co. opened in 1904 and closed in 1920.